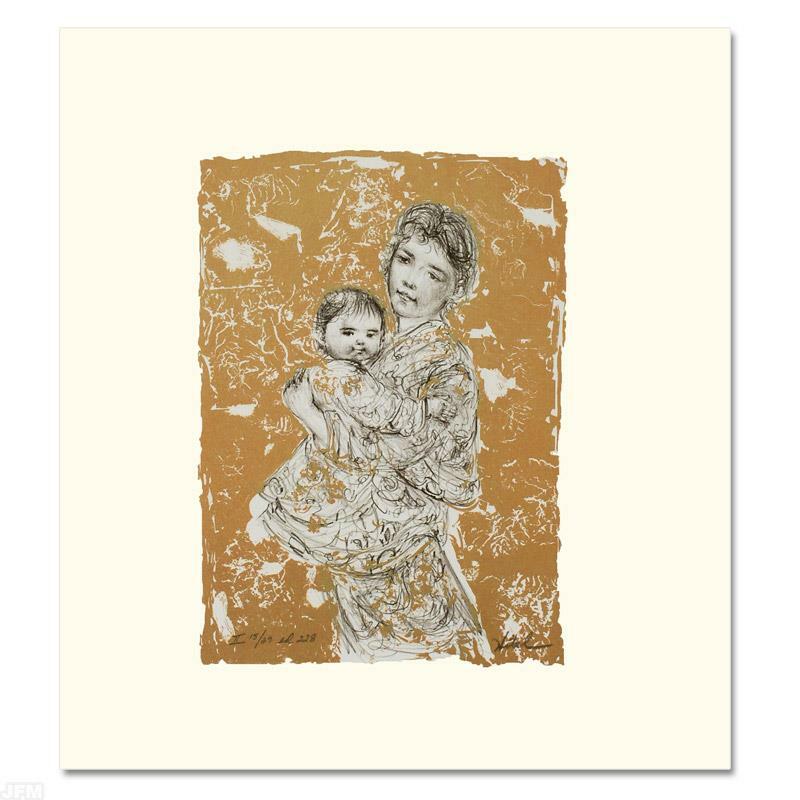 "Golden Dreams" Limited Edition Lithograph by Edna Hibel (1917-2014), Numbered and Hand Signed with Certificate of Authenticity. $350.00 $70.00 Only 4 Left! 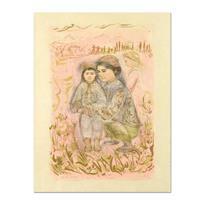 "Golden Dreams" is a limited edition lithograph on paper, numbered and hand signed by Edna Hibel (1917-2014). Includes Certificate of Authenticity! Measures approx. 21" x 26.5" (with border), 9.5" x 13.5" (image). Edna Hibel (1917-2014) grew up in the Boston area and by the young age of 9, she began experimenting with painting in elementary school. 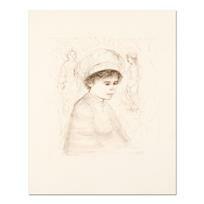 Her summers where spent along the shore in Hull, Massachusetts and in Maine learning about watercolor painting. Hibel received her formal artistic training at the Boston Museum School of Fine Arts, from 1935-1939. In 1942, she earned the Sturtevant Traveling Fellowship to Mexico. When Hibel was just 23, the Boston Museum of fine Arts acquired one of her paintings for their collection making her, at the time, the youngest artist to be purchased by a major American museum. Over the course of her 70 year professional career, her work has been shown in prominent museums and galleries in over 20 countries, including museums located in Brazil, China, Costa Rica, Russia and the U.S.A., and under the royal patronage of Count and Countess Bernadotte of Germany, Count Thor Bonde of Sweden, Prince and the late Princess Rainier of Monaco and Her Majesty Queen Elizabeth II of England. Hibel passed away on December 7th, 2014 in Palm Beach Gardens, Florida just one month short of her 98th birthday. "Marilyn and Children" Limited Edition Lithograph (37" x 27") by Edna Hibel (1917-2014), Numbered and Hand Signed with Certificate of Authenticity. 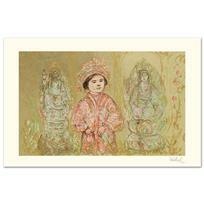 "Willie and Two Quan Yins" Limited Edition Lithograph by Edna Hibel (1917-2014), Numbered and Hand Signed with Certificate of Authenticity. 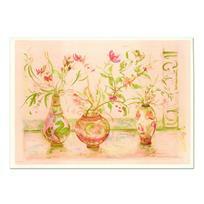 Edna Hibel (1917-2014), "Chinese Vase" Limited Edition Lithograph (41.5" x 29.5"), Numbered and Hand Signed with Certificate of Authenticity. 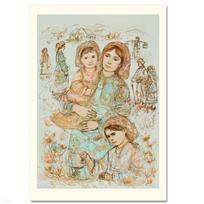 "Family in the Field" Limited Edition Lithograph by Edna Hibel (1917-2014), Numbered and Hand Signed with Certificate of Authenticity. 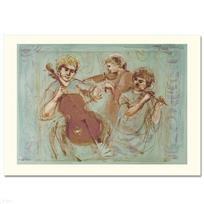 "Trio" Limited Edition Lithograph by Edna Hibel (1917-2014), Numbered and Hand Signed with Certificate of Authenticity. 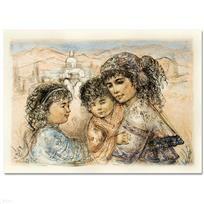 "Sonya and Family" Limited Edition Lithograph by Edna Hibel, Numbered and Hand Signed with Certificate of Authenticity. 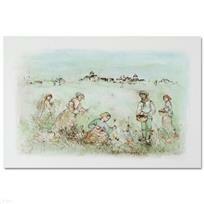 "Tuscan Fields" Limited Edition Lithograph by Edna Hibel, Numbered and Hand Signed with Certificate of Authenticity. 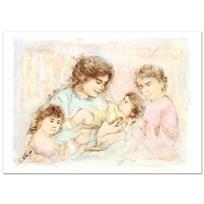 "Zalina with Aries and Ande" Limited Edition Lithograph by Edna Hibel, Numbered and Hand Signed with Certificate of Authenticity.